Set on the stunning Arafura Sea, Skycity Darwin offers great gaming in a tropical resort atmosphere. The casino, which is open around the clock, has 36 tables, over 700 electronic games, impressive VIP areas, five restaurants, and four additional bars. Roulette fans will appreciate the variety of ways to play with conventional, electronic, and hybrid games. Yet even if you don't gamble, the 154-room resort offers endless opportunities to relax and soak up your surroundings. Roulette enthusiast won't be disappointed by the action available at Skycity Darwin. The casino not only offers both European and American variations, but proudly puts three different spins on this storied game. You can choose from conventional, rapid, or Vegas Star roulette at flexible stakes, but it's worth sampling all the styles of play. Conventional roulette is what you'll typically find in the movies and was your only option in Australia up until a few years ago. These traditional tables are staffed by skilled croupiers who run the game. The pace tends to be slow, but it's easily the most social way to play. We've all seen a cliché clip of some hotshot throwing down thousands on a single number, shocking the crowd in the process. While you probably won't see that kind of action on the main gaming floor at Skycity Darwin, watching can be as much fun as playing if the stakes are high enough. If you aren't a purist, you'll want to try rapid roulette. The game still uses a standard roulette wheel, but you won't place your wagers on a table. Instead you'll use a digital terminal to control the action. The game moves at a much faster pace and you play at a wider range of stakes, especially on the low end. Vegas Star roulette is available on widescreen multigame machines. It's the fully digital form of roulette and is even more high-tech than rapid roulette. Based on a random number generator rather than a mechanical wheel, it's similar to online roulette. It's fun to play alongside your mates too. The casino features three dozen tables and 750 electronic games. Enjoy baccarat, blackjack, Caribbean stud, the money wheel, keno, and plenty of pokies. Take advantage of ballooning jackpots and games starting at just a cent. VIPs will want to head directly to Skycity Darwin's exclusive VIP gaming areas. Both Skyroom and Lotus Room offer a refined gaming experience in a phenomenal environment. Be sure to take advantage of these splendid spaces with the service and attention to match if you are eligible. Visitors will want to join Premier Rewards, the casino's great loyalty program. Membership is free and you can rack up points whenever you dine, drink, stay, or play at the property. It's a great way to get free meals, accommodations, chips, and more. You'll also get dozens of other perks like a birthday gift, VIP parking, free beverages, complimentary snacks, and hotel discounts. The program has five tiers, which means the more you play the greater the perks. Yet even the lowest rung on the ladder is brimming with benefits. Skycity Darwin's promotional calendar is always fully loaded with fantastic cash giveaways and prize draws. But even if you aren't much of a gambler, you can find regular drink and food specials, like high tea and a discounted all you can eat dinner buffet. .
You'll find some of the Northern Territory's best dining on the premises with five excellent dining experiences. Enjoy the scenery and sample a delicious bistro menu at The Vie restaurant. 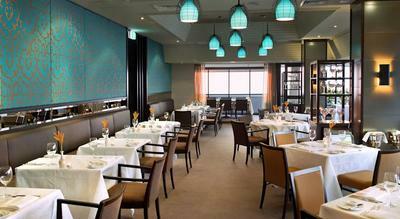 Savour classic and modern Italian dishes against an Arafura Sea backdrop at il Piatto. Delight in a menu that fuses Australian and Mediterranean ingredients for a taste that's greater than the sum of its parts at EVOO. For enticing Asian-flavours with a refreshing Aussie twist, Dragon Court is the place to be. Skycity is also now home to Cove, Darwin's best steakhouse. Everybody deserves a little refreshment now and then. Fortunately, you'll find four great bars on site. Enjoy sports on the city's biggest high definition screen at Aces. Grab a drink while you play the pokies at CentCity. If you believe the perfect pairing for a cocktail is an ocean view, Sandbar is the place to be. For poolside beverages, you'll want to visit Terrace Bar even if you aren't inclined to get wet. The award-winning hotel and beachfront resort at Skycity is a great place to stay. Guests can choose from a fantastic selection of 154 deluxe rooms and hotel suites with excellent amenities. For a truly tropical experience the lagoon resort rooms are unbeatable. Wherever you choose to spend the night, you'll want to take advantage of both swimming pools, fitness centre, sauna, day spa, and easy access to the beach. You can always count on great live performances from bands and singers at Sandbar, yet it's definitely worth venturing off the grounds. Crocosaurus Cover, Berry Springs Nature Park, and Mindii Beach shouldn't be missed. The Museum and Art Gallery of the Northern Territory is certainly worth a look if you feel like taking in some local culture. 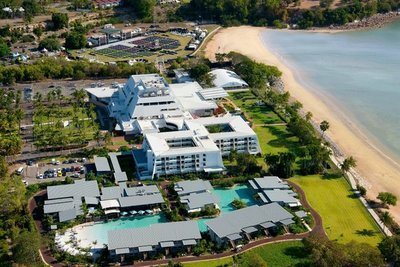 Skycity Darwin Casino accepts a whole host of Australian-friendly banking options. These include Visa, Mastercard, Maestro, PayPal, POLi, Neteller, Ukash, ClickandBuy, and many more.